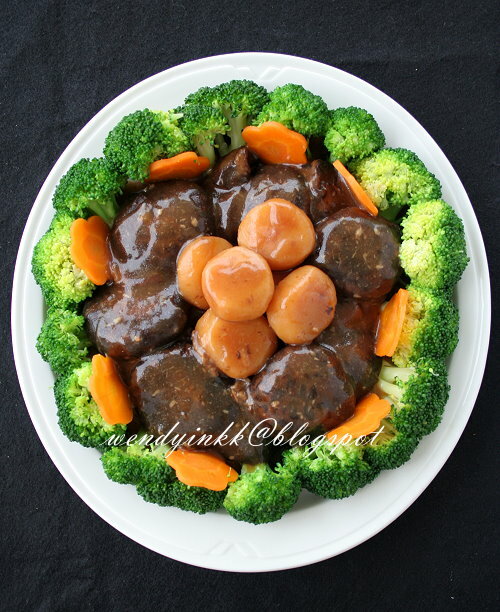 I made this for CNY 2013 because some on my husband’s side prefers vegetarian dishes. They are not vegetarian for religious purposes, but just for health. Few years back, I made another braised mushroom dish with dried scallops and oysters for Reunion dinner. Sadly, it wasn’t well received by the younger ones, except for those above 40. It was barely touched during dinner! Quite sad actually. Luckily, the next day, they were reheated and eaten by the older generation. This time, I tried another way of braising the mushroom, with simpler flavours. I added in waterchestnuts for flavouring and to create another texture to the dish. The outcome was pretty good and the waterchestnuts gave the gravy a sweet and subtle flavour, but distinct enough to be discerned. And it almost looked like scallops, when seen from afar. This time, 2 large plates of braised mushrooms were swept clean! I wonder if it’s because there weren’t many dishes this time, LOL. 1. Soak mushrooms for at least 1 hour, until it has turned soft. Wash and rinse mushrooms clean. Trim the stems away and squeeze away excess moisture. 2. Heat oil in a small pot. Put in garlic cloves and cook until fragrant (no need to be golden). Put in mushrooms and give it a few tosses. Put in 2 cups of water and water chestnuts. 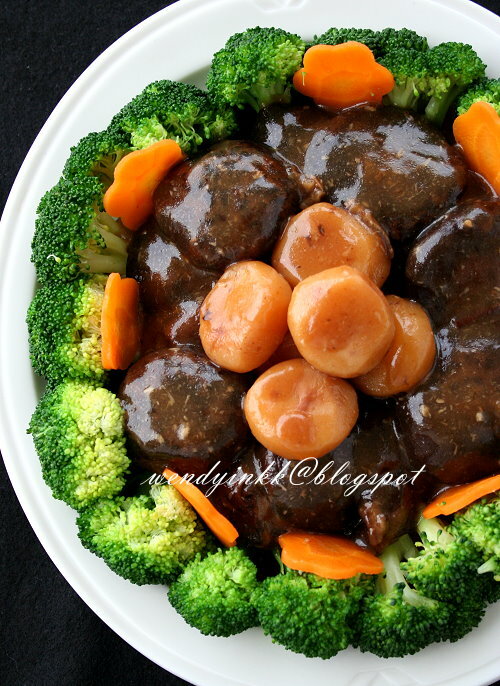 Put in mushroom sauce, soy sauce, shao xing wine and white pepper powder. Bring to a boil and lower to a simmer for 2 hours (covered). 3. Check gravy amount and adjust accordingly. Taste the mushrooms and adjust to your liking (Mine is just nice for me). Thicken the gravy with cornstarch mixture (do not add all, but gradually until you get the consistency you like). Turn off the heat. 4. 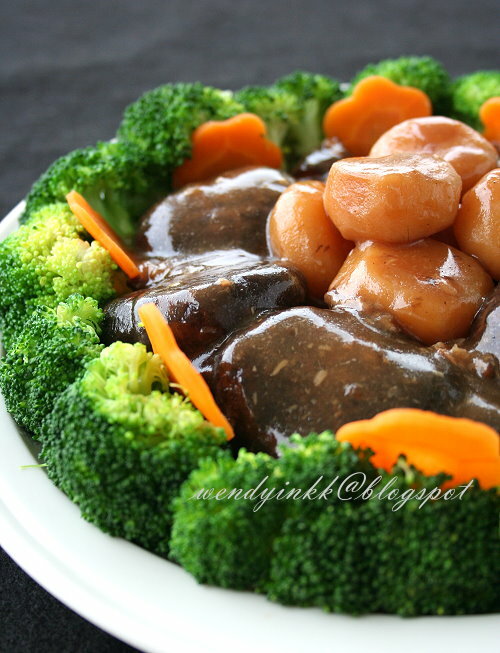 Arrange broccoli florets on serving plate nicely and put in the braised mushrooms and waterchestnuts neatly. Gently pour the gravy over the arrangement. Garnish with carrot flowers. Good suggestion, Wendy! 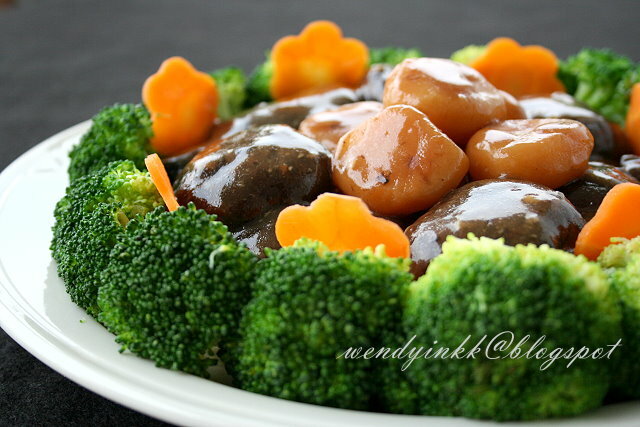 I am thinking of doing a mushroom dish during CNY... this dish looks tempting! Gong xi fa cai! see u soon! Can I use canned waterchestnuts? Love the way you serve this dish, pretty! Will try using water chestnuts. Gong Xi Fa Cai! Wendy, this is like restaurant quality without the MSG. You make vegetables look amazing! I'm a fan of water chestnuts and how it would add texture to this dish. I am not too sure whether it will give the same flavour as I have never used canned waterchestnuts. But I think it should be ok, does the liquid in the can have any flavour? if it does, don't waste it. I have a feeling a dish similar to this one will make an appearance in our reunion dinner tonight. I always enjoy the mushrooms and broccoli. Wendy, wishing you and your family Keong Hee Huat Chye!